The HoverCam Ultra 8 is a brand new to the UK visualiser with incredible capability and revolutionary features. 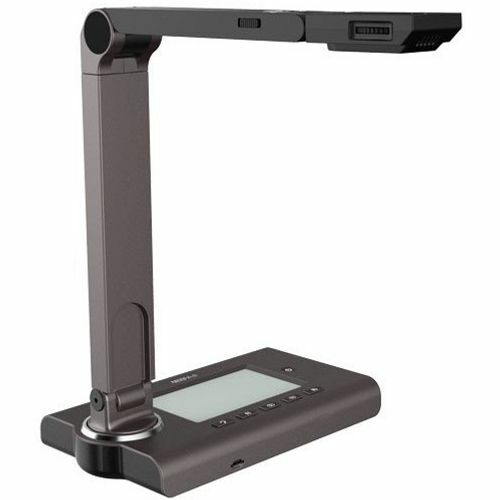 It does so much more than the average visualiser, its a high resolution scanner, HD webcam and video recorder combined. Ultimate Connectivity: - Ultra 8 connects directly to any HDMI or VGA display device, such as touchscreens or projectors, or can connect via USB 2.0 or USB 3.0 SuperSpeed to a PC or Mac. Built-in LCD Display: - Ultra 8s built-in LCD screen lets you see what your class is seeing. With Ultra 8, front of room presentation is easy, without having to constantly turn around to check what is being displayed. Brilliant 8-Megapixel Resolution: - Ultra 8s advanced sensor delivers uncompressed YUV video with 4K clarity, giving you 4x as many pixels than the resolution of a 1080p HDTV, resulting in no image quality loss. Save in .jpeg, multi-paged .pdf, .png, .tiff and others. Software is included for scanning, taking 8MP snapshots and recording full-motionno-lag HD video over USB directly to the computer, which is then easy to share. Or, take snapshots and record video directly to an SD card. It includes an LCD preview monitor that is also used for touch screen control. With Ultra 8 the finest details come to life. Stunning 30fps Full Motion Video: - Ultra 8 utilises a new generation of imaging technology called Photon 1.0. This key technology gives the world, for the first time ever, a visualiser that delivers 4K clarity and full motion frame rate at the same time. This is an unprecedented achievement in USB camera technology. All new generation HoverCams will be equiped with this amazing proprietary technology, allowing you to truly create captivating lag-free video. Zoom Re-invented: - Our Photon 1.0 imaging engine uses Adaptive Sensor Resolution (ASR) technology that adapts to your screen size and gives you all 8 million uncompressed pixels at a 4k magnification. This is equivalent to optical zoom, without the bulkiness and high cost. Warranty:- The Ultra 8 is supplied with a 2 year manufacturers warranty which is extended to 3 years as soon as you register your purchase. This can then be extended to 5 years with the purchase of the optional warranty upgrade. Microscope adaptors are available to allow the projection of the image seen through the microscope for all the audience to see. There is a desktop mount available to secure the unit to a lectern or desk. A carrying pouch is available if you need to transport the folded Ultra 8 or wish to protect it in storage. Included in the pack: Ultra 8 Visualiser, OCR software, HoverCam Flex 10 software (software is embedded into device, no disc), AC adapter, USB 3.0 cable (1.2m), Quick start guide.